a wonderful stage presence and a magical way of connecting with the audience." for combining humour and poignant human commentary has earned him a devoted following of all ages around the globe. Rick’s 8 children’s recordings, co-written and produced by Valley Hennell, have sold over 90,000 copies and won numerous kudos including three Juno nominations and Canadian Folk Music, West Coast Music and Canadian Book Centre Our Choice Awards in Canada and Parents’ Choice, NAPPA Gold, Children’s Music Web and iParenting Media Honors in the U.S. In addition to performing solo, Rick also tours with Joe Mock and Shari Ulrich in B.C.’s iconic folk trio PIED PUMKIN who pioneered rogue folk in BC in the mid 70s and reunited in 1998 after a 25 year hiatus. In 2011 they released a Pied Pear Collectors Edition CD of two albums previously only available on vinyl. In 2009 Rick collaborated on DOUBLE VISION, a duo CD with veteran blues singer/songwriter/guitarist David Essig. Father of six and grandfather of nine, Rick is Goodwill Ambassador for the Down Syndrome Research Foundation. With Fred Penner, he was keynote performer and MC for the 2006 World Congress on Down Syndrome. His song and video ANGELS DO, celebrating children with Down Syndrome, has become an anthem for the special needs community. THE GREAT GAZZOON was co-written, produced and adapted for sound recording by his longtime partner Valley Hennell. The 4 CD music audio novel was recorded and mixed in 2010-11 in their home on Protection Island, BC, by Anthony Maki and his Etched In Sound mobile studio. The cast of 25 actors, singers and musicians includes veterans singer/actors Joelle Rabu, Saffron Henderson and John Payne; renowned blues guitarist David Essig; Doug Edwards of CHILLIWACK on guitar and bass; Nico Rhodes on horns and piano; and human beatbox Kyle Shepard creating vocal foley and SFX. Rick was inspired to write THE GREAT GAZZOON as a novel after learning to walk tightrope for the title role of the Canadian tour of the musical Barnum in 1985. Every night he would walk 30 feet across the proscenium, 9 feet off the ground, singing flat out for the finale of the first act. All was well for the run at Vancouver's Arts Club, but closing night at the Manitoba Theatre Centre, he fell. With no understudy he had no choice but to get back up on the wire for the Grand Theatre run in London. That’s when he learned about fear. As Princess Pindoolah would say, "If I don't feel safe, then I can't have fun..."
The GREAT GAZZOON is the story of facing fear under huge social pressure; of trusting what you love and undoing a villain with a single 8 syllable word; of one boy’s love of music transcending tradition and transforming his community. In 2012 Rick released the musical audio novel THE GREAT GAZZOON, co-written, produced and adapted by his longtime partner Valley Hennell. The 4-hour 4-CD project was recorded and mixed in their home on Protection Island, BC, by Anthony Maki and his Etched In Sound mobile Studio. The unique all cardboard made-in-Canada package includes a 40 page songbook illustrated with 50 original paintings by Ottawa artist Linda Sanborn. 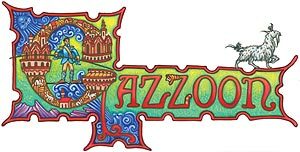 THE GREAT GAZZOON won 2012 Family Choice and Parents' Choice Approved Awards, and was named Children's Recording of the Year in the 2013 Western Canadian Music Awards and Vancouver Island Music Awards. It was nominated for Package Design in the 2013 APA Audie Awards. We gratefully acknowledge the financial support of the government of Canada through the Department of Canadian Heritage (Canada Music Fund) and of Canada's private radio broadcasters and the Music Section of the Canada Council for the Arts.